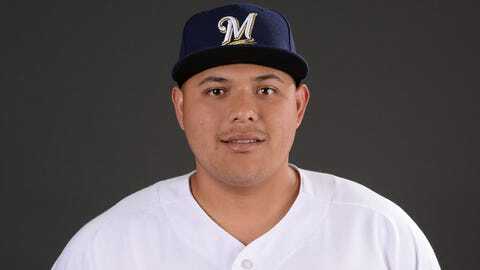 Milwaukee Brewers’ right-handed pitcher Luis Ortiz will join Keston Hiura at the MLB Futures game July 15 in Washington D.C.
Ortiz was named a replacement on the U.S. team Tuesday for right-hander Forrest Whitley, a prospect in the Houston Astros organization. Ranked as the Brewers’ No. 4 prospect, Ortiz has a 1-4 record, 4.41 ERA and a 9.4 K/9 in 49 innings of work for Double-A Biloxi this season. Ortiz was selected in the first round of the 2014 draft by Texas and acquired by the Brewers in the trade that sent catcher Jonathan Lucroy and reliever Jeremy Jeffress to the Rangers at the deadline in 2016. Ortiz has pitched the last three seasons for Biloxi. The 22-year-old owns a career 16-21 record, 3.28 ERA and a 1.24 WHIP in his minor-league career. The U.S. team will be managed by Torii Hunter, a former MLB outfielder and five-time All-Star.